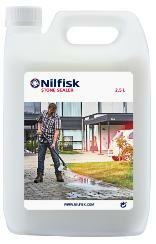 Stone Sealer is a water-based sealing detergent for exterior pavers. Coverage: Depends on how absorbent surfaces are, and whether pavers are old or new. 2½ litres will be sufficient for approx. 100 m2. Stone Sealer ensures that the exterior pavers achieve a repellent invisble ”film” that rejects dirt and algae. Hereby the exterior pavers are easier to clean and ensure longer durability.